ThreeWeeks has been discovering and championing great new shows and great new talent at the Edinburgh Festival since 1996. 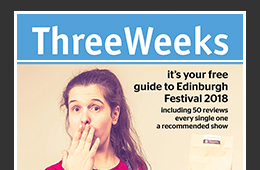 LONGEST ESTABLISHED: ThreeWeeks is the longest established specialist magazine at the Edinburgh Festival, the world’s biggest cultural event, and has been discovering and championing new and exciting comedy, cabaret, dance, musical, theatre and spoken word talent every summer since 1996. HALF A MILLION READERS: Each August half a million festival-goers rely on the ThreeWeeks free magazine, daily email update, website and podcast for a comprehensive guide to all of the festivals that take place in Edinburgh during August, including the International, Book and Art festivals and the awe inspiring Edinburgh Fringe. ALL OVER EDINBURGH: The TW Magazine is available to pick up for free at sites all over Edinburgh during August, with pick-up points in bars, cafes and box offices at all the key festival venues. There will be two editions in 2018 – the Preview Edition in late July and the Review Edition in mid-August. TWO DECADES OF EXPERIENCE: The ThreeWeeks editors have been covering the Edinburgh Festival for 21 years, and provide their expertise and continued passion for the world’s greatest cultural extravaganza each August, interviewing performers, directors and producers, and coordinating wide-ranging coverage of all the city’s summer festivals. VIBRANT REVIEW TEAM: This experience is complemented each year by a vibrant young review team who take in hundreds of shows first hand, sharing their opinions in ThreeWeeks, and helping us spot and champion the best new talent. The TW Magazine is our flagship publication, a full-colour tabloid-sized magazine available for free in sites all over Edinburgh. There will be two editions in 2018 – the Preview Edition in late July and the Review Edition in mid-August. The Preview Edition will be packed with interviews and show recommendations, and will be available to pick up as all the Fringe venues open. We will also deliver a copy direct to the door of thousands of Edinburgh households. The Review Edition will be packed with interviews and reviews and will be available from mid-August. You can pick up a copy from all the key Festival venues, plus cafes and bars around central Edinburgh. Find out where to pick up a copy here or read a digital version of the magazine here. To get all the latest coverage, sign up to the TW Daily bulletin, which will land in your inbox every Thursday in June and July, and then daily throughout the festival month. Inside you will find all the latest interviews and Three To See show recommendations. To sign up for free click here. In addition to the magazine and daily email, there is this website. All of our reviews, interviews and other features appear here too, plus you can search content by genre, by venue or by year. Ever since the start of ThreeWeeks in 1996, a key aim of TW has been to support and champion new cultural and media talent. TW:DIY is a new educational programme from the TW team that will be offering tips and advice to future talent in theatre, comedy and culture at large. Click here to read more. Just like ThreeWeeks Edinburgh discovers and champions great shows, performers and new talent at the Edinburgh Festival, ThisWeek London does the same all year round, with a set of Three To See recommendations every day of the year plus the Caro Meets interviews with some of our favourite performers, producers and directors. 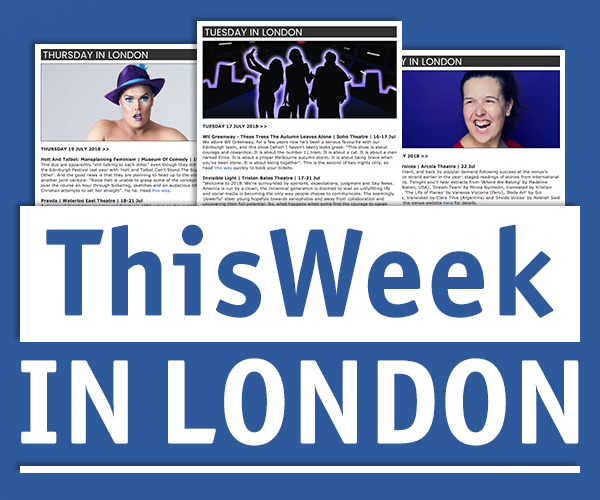 ThisWeek London also benefits from the two decades ThreeWeeks has been covering the Edinburgh Festival, tipping Fringe favourites old and new (and brand new) as they appear in London. 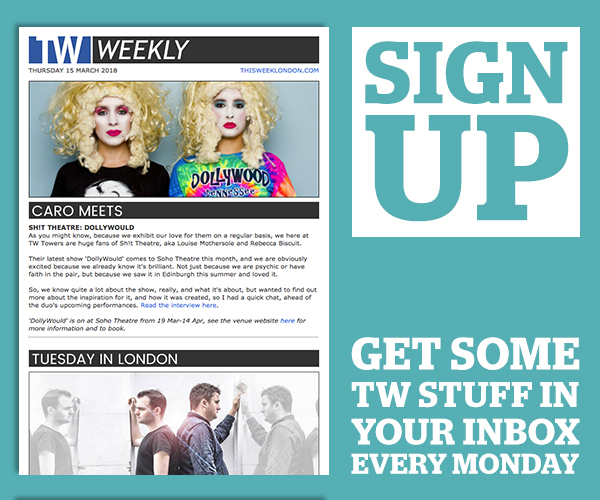 Check all this out online or sign up for the free TW Weekly email. From 1996 to 2013 ThreeWeeks also ran an acclaimed MediaSkills training programme each summer, providing formal and on-the-ground arts journalism training to hundreds of great young writers, giving future arts and media talent guidance, feedback and unique access to the world’s most exciting festival. Alumni from this programme are amongst the current review team. From 2006 to 2010 ThreeWeeks also covered the Brighton festivals that take place each May, and we hope to re-publish archive content from those seasons here in due course. Although we no longer cover these annual cultural events, we still highly recommend them, including the Brighton Festival, the Brighton Fringe, The Great Escape, Artists Open Houses and the Charleston Festival.